Burt Munro Challenge in November last year. These shots showcase most of the riders & machines in the Up to 600cc Class who turned on the roaring spectacle on the streets of small town Bluff, at the southernmost tip of New Zealand in November 2016. Riders like the courageous “Rider 1/2”, acclaimed Aussie battler, double amputee and motorbike racer Alan Kempster. 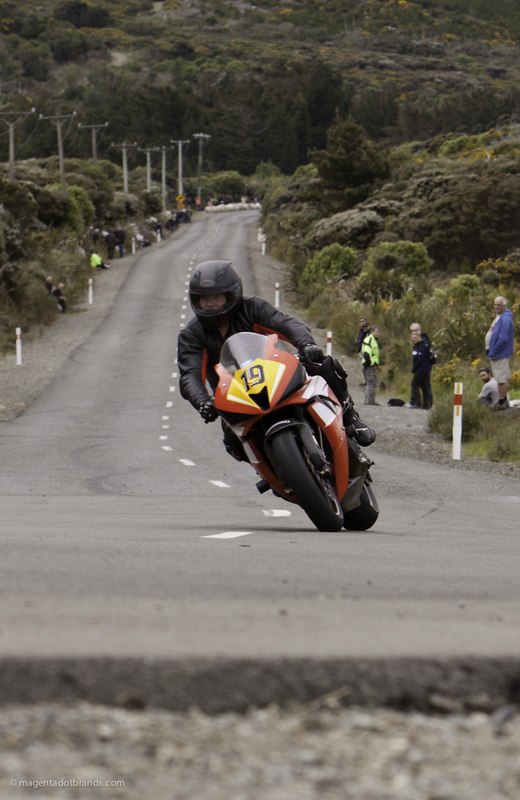 The 36 riders and machines that made their way to the 2015 Bluff Promotions NZ Hill Climb Champs to compete included three from Australia and from as far afield as Rotorua in New Zealand. The Up to 600cc bikes ranged in age from a 2000 Yamaha to 2016 Hondas and KTMs. 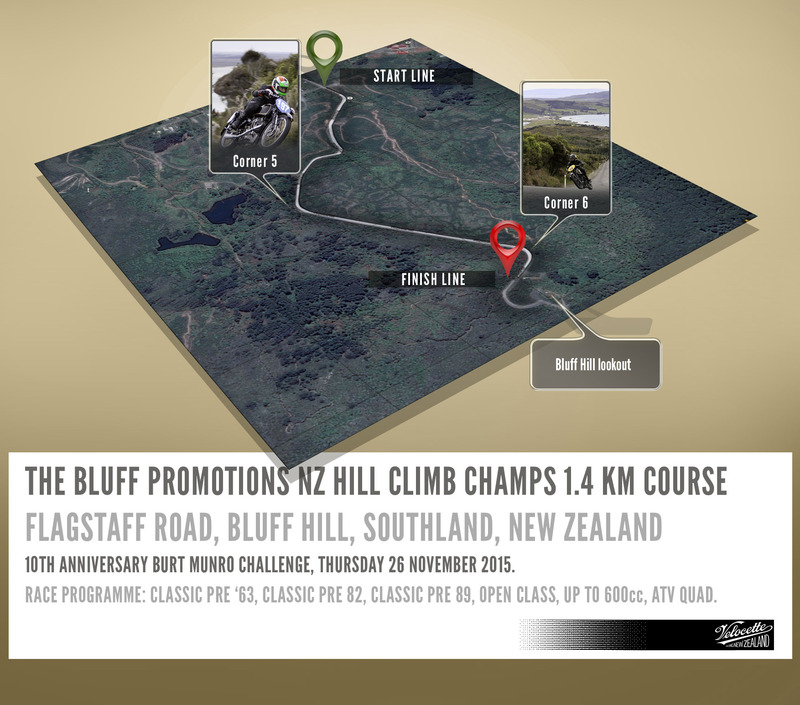 The Bluff Hillclimb is the event kicked that off the four day 2015 tenth Anniversary Burt on Thursday 26 November, 2015. With all eyes upon him and Flagstaff Road’s final long straight undulating into the distance behind him, Graeme Morgan aboard his 2008 Honda CBR 600 RR lines up for the final turn before the finish line. The bikes entered in the Up to 600cc class ranged from a “big bike look” Honda NSR 150, up to 600s including Graeme’s Race Replica version of Honda’s CBR600F series, with class-leading power-to-weight ratio. Shooting Classic Motorcycle action Photography at the Burt is about capturing the speed, and when possible the adrenalin fuelled expression on the rider’s faces. As mentioned in the Classic Pre ‘82 gallery post, on the Flagstaff Road course there is also the opportunity to select viewpoints that allow capturing the Burt’s signature backdrop of dramatic Southland vistas. Good sports images are most often taken with the subject in motion, with racing motorcycles great shots are often shot from the lowest point of view. Looking up from about axle height increases the likelihood of capturing a high-speed sequence of hero shots as bike and rider approach and sweep by. This gallery contains start-to-finish sets of most riders in the Class from four vantage points ascending Bluff Hill, beginning with Rider 1/2, Alan Kempster from Australia. If you enjoyed this 2015 Burt Hillclimb gallery check out the Classic Pre ‘63, and Classic Pre ‘82 galleries. Returning to the four-day Burt Munro Challenge in 2015 was Rider 1/2, the acclaimed Aussie battler, world disabled waterskiing champion and motorbike racer Alan Kempster. Alan is a double amputee who lost his right arm and right leg in a motorcycle crash, he made a memorable impression on the public and competitors alike when he first took part in the 2013 Burt Munro Challenge. Kempster, 51, is competed in four events during the 2015 four-day Burt Munro Challenge, which began on November 29. Previous Post: ‘Only two for Everest’ 1951.